Hayward’s Above Ground Cleaners: What’s the difference between the three? Actually, not much. In fact, it’s just a personal preference of which of the decorative cleaner shells you prefer. We gave our above ground pool line of cleaners more flair then you would find in other categories. It’s just more entertaining. At the end of the day, they all do the same function. So the a/g cleaners have the same SmartDrive inside? Exactly. They all use the patented SmartDrive technology, which allows the cleaner to have a specific cleaning pattern for the best pool coverage. Does horsepower matter when it comes to these suction cleaners? Well, of course, the strength of the pool pump is important. At the end of the day, what we really need is around 20 to 25 gallons per minute (GPM) minimum, which can be achieved with the half horsepower. To be safe, I would say that a three-quarter horsepower is the safer choice to properly operate these cleaners. Are these A/G pool cleaners meant only for dish bottom pools? They’re really made to travel on a flat bottom pool. If you have a small dish or a small inclination, they will still work. As soon as you get to a steep slope, then they won’t be able to cover the entire pool. 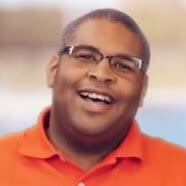 What are the differences between your inground pool cleaners? Yes. Well, I would say first that the Pool Vac Navigator technology is more than 23 years old proven technology, one of the most well-known cleaners in the market. They are reliable. 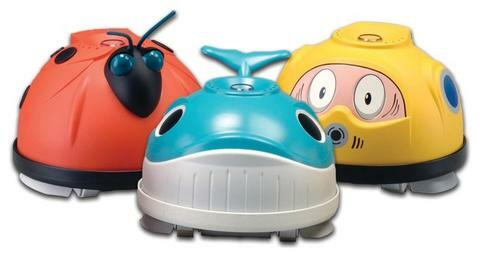 They are proven to have one of the best pool coverages on the market with the SmartDrive or AquaPilot steering system. As far as the pool cleaner Poolvergnuegen or the AquaNaut, which is just a newer version of the pool cleaner, they are recognized to be very reliable, simple. In term of obstacle management, they offer the best performance. If you have a lot of obstacles in your pool like main drain covers, this one won’t get stuck in any of these. 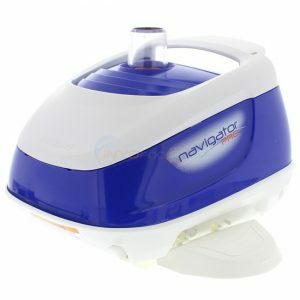 In term of pool coverage, the Pool Vac and Navigator are still the best options. If you have some challenge in term of obstacle management, AquaNaut pool cleaner Poolvergnuegen will be your number one choice. Tell us a little about the relatively new, TriVac Pressure Cleaner. The TriVac is the most recent addition to our cleaner range. It’s a pressure side pool cleaner, which means that it operates with a booster pump. The good thing about the Trivac is that it does not send debris to the filtration system because has its own debris disposal bag. If a poolwner is concerned about a lot of heavy debris clogging your skimmer or filter, this is a good choice. That said, you need to have a pool that is equipped with a booster pump. The nice thing about this one, it uses an Aquadrive propulsion system to propel the cleaner on the pool. It does no traction. All of these are free-turning wheels, so it doesn’t damage the pool surface. It’s very gentle on the pool surface. The Aquadrive system will also allow the cleaner to back up of any obstacle very quickly. You will have a very good pool coverage, a very high suction power, ease of maintenance because the only thing that you have to do is clean the bag when it’s full. You don’t send any debris to the filtration system. The TigerShark is your main robotic cleaners, what makes the AquaVac 500 and SharkVac standout? 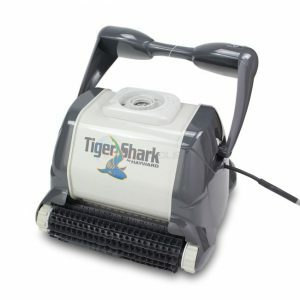 The TigerShark is one of the best-known robotic pool cleaners on the market because it’s one of the most reliable and field-tested. It performs well on almost every pool application, plus it is very easy-to-operate. The best benefit of robotic cleaners is the fact that they are a standalone system. You don’t need a booster pump. You don’t need to connect it to your filtration system. A robotic cleaner is an all-in-one, self-propelled cleaning machine. The TigerShark Robotic Cleaner is energy efficient because it uses a minimal amount of energy to operate. With that said, the TigerShark is the legacy product. It’s a bit older but proven technology. When you move to the SharkVac, the second product on the range, you have the same drive system, traction system. You have same comfort features such as the top access through the cartridge element filter, which make it easier for cleaning and maintenance. With TigerShark, you have to flip over the cleaner. As far as the 500, it’s still the AquaVac technology in term of drive system motor box, but you have more advanced programming feature. On the power supply, you can decide whether you want to clean the pool bottom only, bottom and wall, or if you want to program a recurring timer. This allows the cleaner will start every two day, every three days. You can program it, leave it in the pool, and it will clean for all week the pool. You have advanced programming feature on this one. Finally, the AquaVac 500 is equipped with a swivel on the cord. It offers less cord tangling than other cleaners where you have to untwist the cord more often.